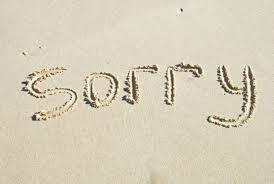 A while back, during my Bikram Yoga class, I realized I say “I’m sorry” a lot. And how did my wandering brain land there, you ask? Well, I was having a crappy class…I even had to ask for an Emergen-C halfway through…and as the class was with a teacher I really like, I was kind of humiliated. I know my practice is for me, but I still prefer an approving glance to an “are you okay” face. More recently, the topic of saying “I’m sorry” came up with a friend. I was saying (okay, bitching) that another friend had done something really kind of, oh, let’s just say – not nice. And I said, “Really, she could just f–king say ‘I’m sorry’. It costs nothing!” You know, like when someone accidentally bumps you on the street and you say “Oops, I’m sorry”. Generally they then realize they were at fault, apologize, and the world keeps spinning. And that’s really the point. So many times throughout the day, a simple “I’m sorry” can make all the difference in the world. It doesn’t even mean you’re wrong. It just means, in many cases, that you’re ready to move on. No biggie. Drop it already. But there is another kind of “I’m sorry” that I hear coming out of my mouth sometimes, and it’s not one I like. Occasionally, I will catch myself saying it when what I really mean is “Oops, did I just say that really honest thing to you? Now I’m embarrassed, and I’ll pretend it was a mistake”. Have you ever done that? Yes, of course you have. We all have. And there are those moments when the reaction to your statement indicates that an apology (or recanting) is in order. But then, there are those other moments when it’s just, I guess, shyness. Or a desire for affirmation. Or a way to fill a shocked silence. Did I have a point? Well, maybe not. I’ve been thinking a lot about Philip Seymour Hoffman and his untimely death this week, apparently from a heroin overdose. Mr. Hoffman was an amazing actor, and a charming man who I was fortunate enough to meet more than once. According to the reports, he had been sober for over 20 years, relapsing in just the last year. Some people think dealing with addiction is simply about willpower – hopefully more know that it is a disease, and one that can only be managed, not cured. But that’s not what I’ve been thinking about, really. What has really bugged me about the conversations surrounding Mr. Hoffman’s passing is that all of a sudden, people are talking about how tragic it is that addicts die from overdoses, and how we should help them more. Seems odd that that would bother me, I bet. Well, it does. Because frankly, a celebrity has far more access to, and certainly more money to pay for, help. In fact, checking into (and ideally completing) a rehab program has sadly almost become a rite of passage. I’m upset because we need to have this conversation about those suffering from the disease of addiction EVERY. DAMN. DAY. and we need to have it on behalf of everyone – not just celebrities. It’s hard to find an accurate statistic, but my lazy, on-the-couch research suggests that over 100 people on average die each day from overdoses. This number does not include those who are struggling, but surviving, by the way. Nor does it include those whose drug is alcohol. So while you gossip about/criticize/sympathize with/mourn for the famous among us affected by the dread disease of addiction, spare a moment for everyone else. You may find that everyone else includes friends, family members, colleagues….in fact, I would bet a dollar I don’t have that all of us know at least one person in need of support. So again, please, think of everyone else. And perhaps try to help. P.S. I’m not the kind to post a bunch of links to helping organizations, but if you need help, Alcoholics Anonymous and Narcotics Anonymous are among the best – and have resources for your family and friends through Al-Anon. And if you, like me, are in the entertainment industry, try The Actors Fund. Please. P.P.S. There’s really no appropriate photo for this post, in my opinion. Just look with love on the everyone else – that’s your picture for today.